This black frame has non-flashing wheels to fit your preference. The seat is rated to hold up to 300lbs., and the frame has a 39.5 telescoping handle. The insert bag is made from premium water resistant 600D polyester material. The patented design Zuca sports frame is graceful and versitile. It features a light super-strong alunium frame and oversized polyurethane wheels that climb stairs. 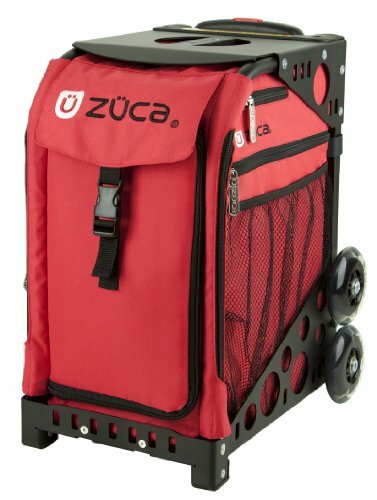 The Zuca sport frame includes a removable hand-washable sports insert bag, a built in seat, and tons of custom combos. This black frame has non-flashing wheels to fit your preference. The seat is rated to hold up to 300lbs., and the frame has a 39.5" telescoping handle. The insert bag is made from premium water resistant 600D polyester material.